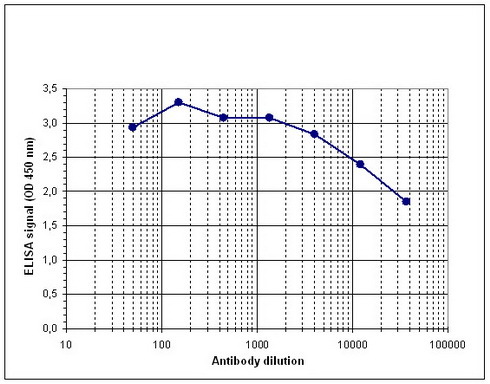 The immunogen for anti-ACTL6B antibody: human ACTL6B (actin-like 6B), using a KLH-conjugated synthetic peptide containing a sequence from the central part of the protein. 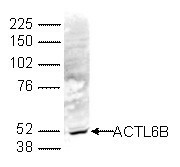 ACTL6B (UniProt/Swiss-Prot entry O94805) belongs to the family of actin-related proteins (ARPs) which are involved in diverse cellular processes such as vesicular transport, spindle orientation, nuclear migration and chromatin remodeling. 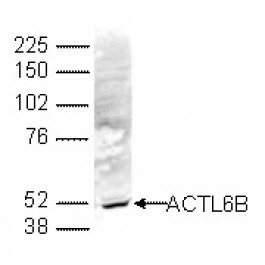 ACTL6B is a subunit of the BAF (BRG1/brm-associated factor) complex in mammals, which is thought to antagonize chromatin-mediated transcriptiol repression thereby facilitating transcriptiol activation of specific genes. Further, ACTL6B may be involved in gene regulation by structural modulation of their chromatin, specifically in the brain.